Salem Academy and Salem College trace their origins to 1772, when the Moravian community in North Carolina started a school for the education of young girls. This first school met in one room of the Gemein Haus (congregation house) in the Salem community with one teacher and three young students. In 1804 the school was opened to those outside the Moravian community, and the first boarding students were admitted. Classes were taught in German and English, and girls arrived from across North Carolina, South Carolina, Tennessee, and Georgia. In 1866 Salem Female Academy sought and was granted an act of incorporation from the North Carolina General Assembly. Besides clarifying taxation status, incorporation enabled a measure of identity separate from the church and prepared the academy for its evolution into separate academy and college programs with appropriate courses and degrees. 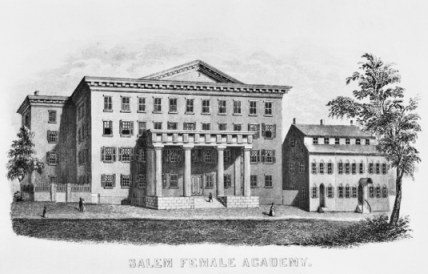 By 1890 the first bachelor of arts degrees were awarded, and Salem Female Academy became Salem Academy and College. In 1912 the academy and the college separated academically. Fulfilling the hopes of thousands of Salem students and alumnae, Salem inaugurated its first woman president, Julianne Still Thrift in 1991. The thirteenth-oldest college in the nation and the first to be founded for women, Salem College in the early 2000s enrolled more than 1,000 women in its liberal arts and professional programs. Salem Academy, a college preparatory/boarding school for girls in grades 9 through 12, shares the 57-acre campus. The academy has an enrollment of approximately 200 girls, both boarding and day students. Both institutions continue to reflect the Moravians' commitment to the education of women. Frances Griffin, Less Time for Meddling: A History of Salem Academy and College, 1772-1866 (1979).